Description: Make a custom 44″ tall wooden post sign holder. We will provide all of the supplies including: 4X4 post, wooden squares, paint, varnish, letter stencils, hook and 2 sign boards (front and back can be used). This project is also available as a kit. Need sign board pinspiration? 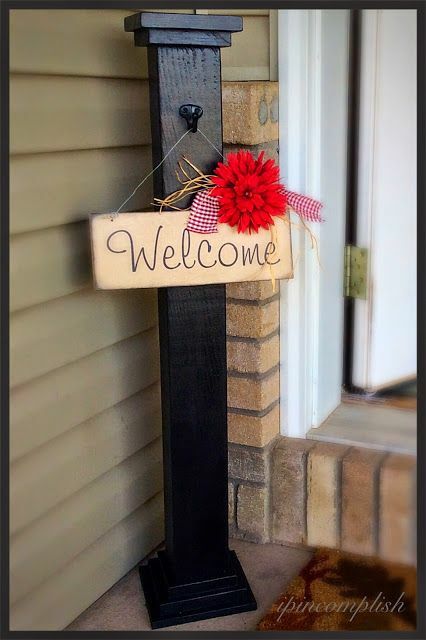 What about Welcome, Halloween, Fall/Thanksgiving, Christmas, Valentines…you can also bring your own embellishments and letters! RSVPs for this craft are due by Wednesday, September 17 so we can buy supplies ahead of time.